After completely flaking in February, and being too-busy in March, here I come again with a Mixology Monday submission for April. Anna from Morsels & Musings is hosting this month, and she's chosen the theme of Fruit Liqueurs. 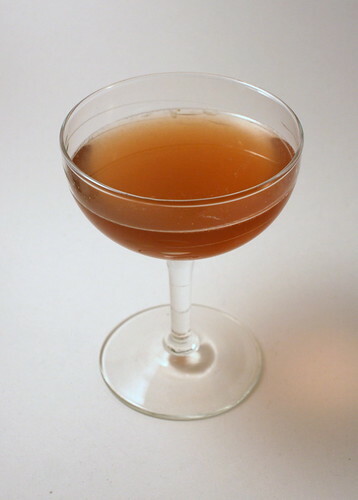 This is fertile ground, as there are tons of interesting liqueurs on the market, and they're among my favorite ingredients to mix with -- the best have strong flavors, balanced with enough sweetness to tame the spirits' bite and stand up to things like citrus and bitters. But what fruit liqueur to use? I have a few -- a couple different varieties of crème de pêche (as seen in my previous MxMo submission, the Pêche de Resistance), some crème de figue (fig), some crème de fraise des bois (wild strawberries -- this liqueur is amazing), some crème de cassis (black currant), some cerise (cherry), framboise (raspberry)-- wait a second. Framboise! The tartness and sheer intensity of raspberries makes them one of my very favorite fruits (and alas, their fragility puts them on the expensive side as well -- I can never get enough raspberries when they're in season.) So, after a trawl through The Joy of Mixology, I was thinking about two cocktails in particular as jumping-off points. The Corpse Reviver No. 2 is one of my very favorite cocktails, and like Dr. Cocktail (though no way do I claim to know even a tiny bit as much as he does), it set me on the path of cocktail geekdom. This drink features equal parts gin, Cointreau, lemon juice, and Lillet Blanc, and it's tied together with a few drops of absinthe or pastis. It's a truly amazing drink, and well worth your time. The other cocktail I was considering was the Pegu Club, the house cocktail of the British Colonial Officers' Club in Pegu, Burma. (Not incidentally, of course, it's also the namesake of one of the best cocktailian bars around.) This is also a gin-based libation, appropriate for those tropical climes that don't have air conditioning, such as Rangoon (or Manhattan in July.) Accompanying the gin is orange curaçao, lime juice, and doses of both Angostura and orange bitters. Note: I made this with an ordinary framboise liqueur (Les Delices de Saint Paul), but I think it'd be even better with Chambord. Chambord's got an even more intense raspberry taste than the liqueur I used, and a thicker, almost syrupy mouthfeel. I think it'd stand up to the lime juice better. For the gin, I used Plymouth, my usual standby. For me, one of the hardest parts of coming up with a cocktail is settling on an appropriate name. A friend suggested "the Carla Bruni", which appealed...but I decided to save that name for something involving both French and Italian ingredients. But moving in that same direction, I thought about other French beauties of the age, and of course Catherine Deneuve sprang to mind. Icy at first, but with a smoldering sensuality. I liked it. UPDATE: The MxMo roundup is now up at Morsels & Musings. Many thanks to Anna for organizing and hosting it all. Hi -- I'm just starting out as an amateur mixologist, and love your blog. Found this drink, and, happening to have all the ingredients, I made it last night. Unfortunately, it came out sort of medicinal-tasting, like a cough syrup. What did I do wrong? I feel like I might have overbittered it -- could that have caused it? What does this drink taste like when all goes right? Thanks.